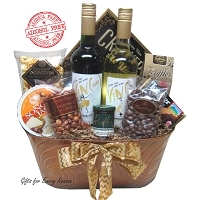 We are the very FIRST Gift Basket company to offer premium non-alcoholic wines in our baskets. Our trendy and unique Alcohol Free WINE gift baskets make the perfect personal present or corporate gift. Not your typical apple cider drink, these are premium award-winning alcohol-free WINES. The wines are traditionally vinted like all great wines, and then matured in stainless steel barrels to maintain their flavour. Gluten free, low in sugar and calories. Only 2 points on weight watchers which make them a healthy alternative to apple cider drinks. Perfect for people who cannot drink due to medications or other illnesses or for those who choose not to drink. 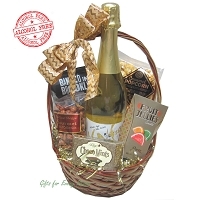 And don't forget Gifts for Every Reason offers no minimum FREE Delivery on ALL our Gift Baskets.